Face Switch HD - Swap & Morph ! Swap, blend, morph any two faces you want in seconds! 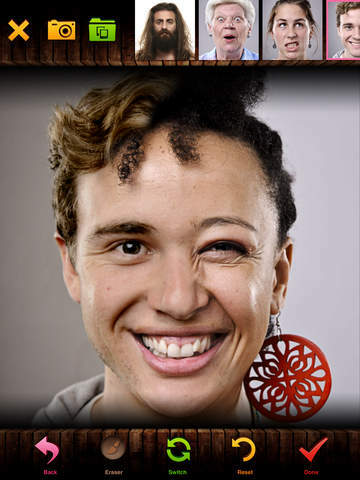 Download Face Switch to see what you and your partner’s child might look like, check out yourself with a new haircut, or just mash together random faces into a mix of the two for hilariously entertaining results today! ⁃ Swapping faces with a swipe of a finger. ⁃ High Quality blending effect. PICK ANYONE TO PLAY WITH! ⁃ Load a front facing face picture from your photo album. ⁃ 4 faces in gallery to start with. ⁃ Download front facing celebrity photo from Internet. ⁃ Take a shot with the app. 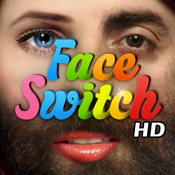 ⁃ Switch for instant face swap. ⁃ Save best mixes and share them! ⁃ Save it to photo album for later use. ⁃ Browse Face Switch community gallery. ⁃ Fast and accurate automatic face detection. Note: For best results use front facing pictures ! ⁃ NEW: Great photo packs. ⁃ Photo filters, stickers and more. An innovative new recreational photo editing app, Face Switch has everything users need to mix and match various portrait photos together whenever they want, and for whatever reason they can come up with! The app itself is incredibly easy and intuitive to use, users simply pick the two pictures they want to blend and Face Switch does most of the leg work. To mash together faces users simply place the photos one an top of the other and swipe to blend the facial regions they’d like to transform. The app is easy to navigate, and includes a full user manual for novice face changers as well. 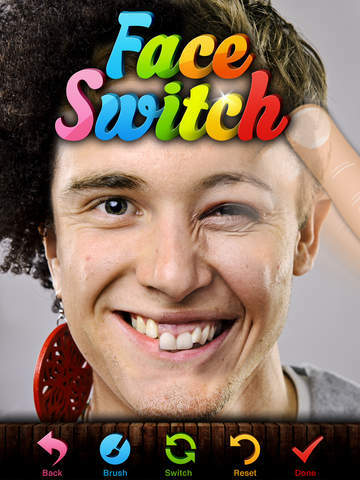 Face Switch comes complete with sixteen stock photos for users to experiment with the second they download the app, and choosing custom photos to mix and match is as easy as importing the photos from their mobile device’s saved photo library. To help users get a look they’re happy with, a soft edged “brush stroke” feature is included to ensure users’ facial experiments always yield realistic results. Meanwhile, the app itself automatically detects where faces are within imported photos to guarantee that ready-to-blend faces are always perfectly lined up one under the other. Once they’re done users can share their creations with friends and family via Facebook, Twitter, Tumblr, or via email too! Whether you want to try your dad’s mustache on for size, see what your best friends would look like if they were one person, or just make a funny face for the fun of it, Face Switch is the face-changing photo app that puts hilarious photo mashing action right at your fingertips!